When you taste it you will understand. Check out the rack of wild boar cooking video below and then order your own rack in our online store. Watch Chef George prepare a succulent rack of wild boar. Prepare to drool! This meat is lower in fat and higher in moisture than pork. This means wild boar will cook more quickly than pork. Since wild boar muscle has more marbling, do not cook steaks and roasts past medium done stage. For more recipes check out our blog. Wild boar meat needs to be fully cooked before eating. Wild boar brochettes are great on the BBQ. 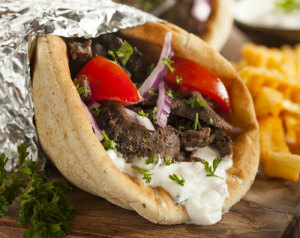 Stuff them in a pita with tomatoes onions and lots of tzitzki sauce. It’s a great summer treat. 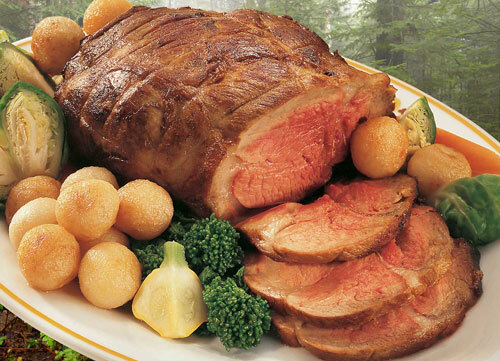 Shoulder roast is a marvellous dinner idea for family and friends. A great and easy way to impress your guests. The best way to cook boar is low and slow because this breaks down the connective tissue and results in fork tender meat. Roasts can be cooked at 275-300 F (135-150 C). Wild Boar medallions, steaks and strip loin are all very scrumptious. Wrap them in bacon and fry them in a sauce pan. Steak can be cooked on the stove or on the bbq. Tenderize the boar by marinating it for a few hours. Wild boar rib rack is a meal for special occasions. Absolutely delicious. Watch our Chef cook up this wonderful and elegant dish in the video above – if you haven’t already. Try it ground in burgers, meat sauce, shepherd’s pie and tourtiere. You can use boar meat anywhere. Meatballs really benefit from the extra flavour and kick of wild meat. Surprise everyone with spaghetti and boar meatballs. Amazing. Substituting wild boar in any of your favourite pork recipes will cut calories and enhance the flavour of the dish. Who would have thought to start seeing this non-traditional meat making its way onto the menus at your favourite restaurants? People are choosing healthier lifestyles. Many of the less-conventional, “specialty” meats such as wild boar are gaining popularity for good reason It’s lower in fat and higher in protein than the American favourite-beef. This meat has delicious flavour but little fat, making it a hit with health conscious individuals. While wild boar may be ugly and have a bad reputation for their wild behaviour, they’re making their way onto our plates because of their excellent nutritional profile. Yes, this is a very healthy meat. Much more so than it’s cousin the pig. Taste the difference of the Northfork’s wild boar. This meat is a flavourful alternative to domestic pork. Big on flavour low on fat, this meat is incredibly lean. This means that the meat should be carefully watched during cooking as it cooks faster than pork. It is as delicious as it is nutritious – low in fat and cholesterol with a nutty, sweet and rich flavour. Unlike the wapiti and bison that we sell, wild boar meat needs to be fully cooked before eating. Wild boar is a lean cut of meat with the great taste of wild pork without the fat found on your typical pork. They are not administered any antibiotics, hormones, or any chemicals or additives. 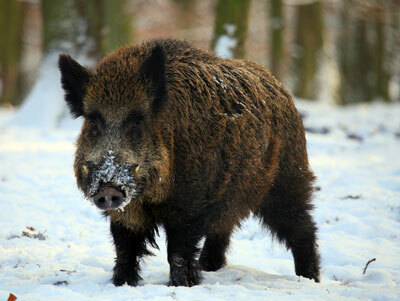 Very hardy, unlike the pig, wild boar is not prone to illness or disease. Healthy animals become a healthy dinner for you. And one bad point: It’s a bit high in cholesterol but less so than pork. Wild boar meat shipped to your door! It’s easier than ever to try the great taste of wild boar. Order online from Northfork and your meat will be custom cut once we receive your order. Our Canadian distribution facility will ship your order in our custom coolers full of ice and your boar meat will ship to your home or office. Please pick a delivery address where someone will be available to receive your package of all natural meat – as we want to get it to you directly. To conserve the ice, it is best not to open the shipment until you are ready to place the order in the freezer. Enjoy wild boar meat. It’s excellent.